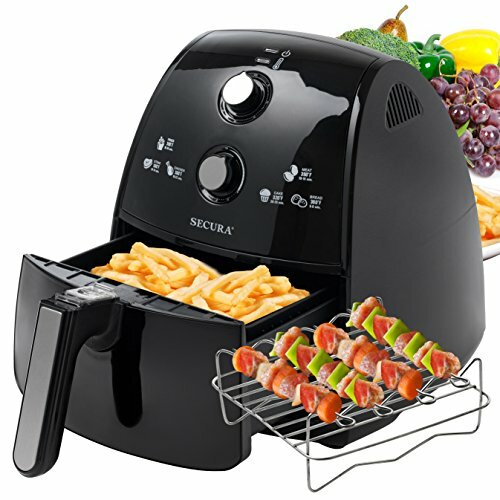 The Secura SAF-40 electric hot air fryer attracts buyers looking for a medium price point and ease of use. You can depend on it to meet your expectations for air fryer recipes consistently. This model ships with a toaster rack and skewers. These accessories expand your cooking options right out of the box compared to appliances that only include the basic cooking basket. The manufacturer styles it as an “extra large” air fryer, but its 4-liter (4.2-quart) capacity actually places it in the middle of the road for size. As for the durability of this appliance, users report mixed but mostly positive performance. The 120-volt, 1500-watt appliance has a temperature control with settings from 180 to 390 degrees Fahrenheit. The analog timer runs for up to 60 minutes, and the machine shuts off automatically when the time expires. Secura distinguishes itself somewhat with a 2-year manufacturer’s limited warranty, so you’ll get a replacement if you’re in the minority that encounters trouble. Except for washing the pan and basket with warm soapy water, the appliance is ready to use out of the box. Position it on a counter and make sure that it is not near any materials that cannot handle some exposure to heat. The user manual includes a troubleshooting guide and cooking guidelines. Secura model SAF-40 weighs 10.3 pounds. At 13.25 inches tall, the air fryer will fit easily on a counter underneath your cabinets. Its width is 12.4 inches and depth is 14.8 inches. These dimensions create a compact footprint for the machine. Rounded corners and gently sloping sides define its minimalist design. Centrally located front-facing controls give the black appliance a symmetrical appearance. The air fryer’s basket has a capacity of 4 liters or 4.2 quarts. Although this sounds like a lot of space, keep in mind that food items in an air fryer should not touch or overlap to ensure even cooking. The basket has a nonstick coating, and a release clip on the handle enables one handed removal from the cooking chamber. Hundreds of user reviews have accumulated online since the release of the Secura SAF-40. The vast majority are positive, and most buyers consider it a fair value for its price. People report food results that range from acceptable to delicious. For the most part, people consider the appliance easy to use and keep clean. A minority of buyers experienced technical breakdowns soon after their purchases. Other complaints included difficulty reading the small lettering on the controls and a lack of precision from the analog timer. Secura stands by this product with a 2-year limited warranty that covers repairs or replacement. If you have a problem with this air fryer, you need to report the issue to the manufacturer within 60 days. You’ll also need to show that you bought the SAF-40 from a reseller or distributor authorized by Secura, so buy yours from a trusted source and keep your receipt. Should I Buy the Secura SAF-40? This model might satisfy your needs if you’re cooking for 1 or up to 4 people and looking to control cost. With a compact size and relatively long extension cord, you’ll have little trouble positioning it in your kitchen. As an air fryer, the Secura SAF-40 performs well for reheating leftovers and low-fat cooking. If its features match your requirements, then we recommend purchasing this model. If you own this Secura Air Fryer we’d love to hear from you. Share your experience with this airfryer model below.